In the past, employers typically had until the end of February, if filing on paper, or the end of March, if filing electronically, to submit their copies of these forms. 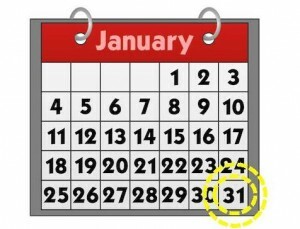 According to the SSA, January 31st is the new filing deadline for both electronic and paper Forms W-2. Note: The January 31 deadline for employers to furnish copies of Forms W-2 and 1099-MISC to employees and independent contractors also continues to apply. In addition, there are changes in requesting an extension to file the Form W-2. Only one 30-day extension to file Form W-2 is available and this extension is not automatic. If an extension is necessary, an IRS Form 8809, Application for Extension of Time To File Information Returns must be completed as soon as the employer knows an extension is necessary, but by January 31. Employers should carefully review the Form 8809 instructions for more information.